1-abc.net File Configuration Box - extend Windows Explorer’s file features! Your all inclusive package to extend Windows Explorer’s file features! It does not matter if you have videos, music, documents or other data: Whatever it is, it is saved to files on your Windows system. The Windows internal file manager called Windows Explorer offers many good and useful functions to organize your data. Anyway, there are many things that can not be done with it. Erasing files completely, splitting and merging them, encrypting and decrypting, batch modes for attribute changes, renaming or replacement procedures are just a few things that your Windows system normally does not include. This is the reason why there are many 3rd party tools available that were made to close such feature lacks. 1-abc.net File Configuration Box goes one step further: When anyone needs such features from time to time, would it not make sense to have one product that includes all these functions instead of different single programs? The 1-abc.net File Configuration Box includes 8 fantastic file and folder tools that extend your Windows with all these file features all users dream about. 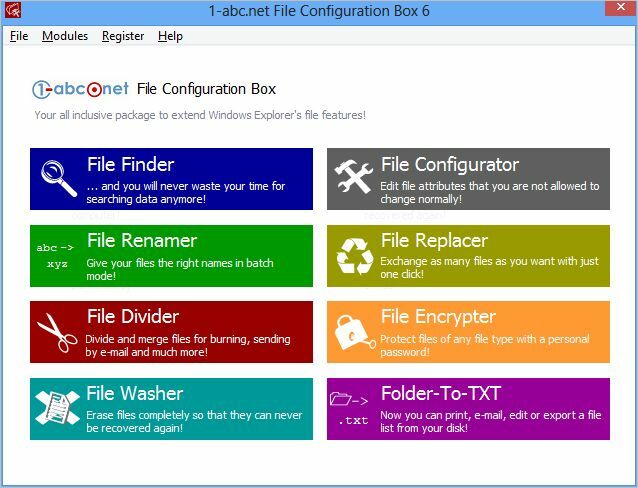 This program combines all functions of 1-abc.net File Finder, 1-abc.net File Renamer, 1-abc.net File Divider, 1-abc.net File Washer, 1-abc.net File Configurator, 1-abc.net File Replacer, 1-abc.net File Encrypter and 1-abc.net Folder-To-TXT with a very easy-to-use interface. 1-abc.net File Configuration Box – your files have never been managed easier and more professional before! File Finder … and you will never waste your time for searching data anymore! File Renamer - Give your files the right names in batch mode! File Divider - Divide and merge files for burning, sending by e-mail and much more! File Washer - Erase files completely so that they can never be recovered again! File Configurator - Edit file attributes that you are not allowed to change normally! File Replacer - Exchange as many files as you want with just one click! File Encrypter - Protect files of any file type with a personal password! Folder-To-TXT - Now you can print, e-mail, edit or export a file list from your disk!